SIPOC diagram is a Six Sigma tool used for documenting business processes. The word SIPOC stands for Suppliers, Inputs, Process, Outputs, and Customers which form the columns of the diagram. SIPOC diagram visually documents a business process from beginning to end. Because the diagram doesn’t contain much detail about the process, it is often called a high-level process map. The diagram is useful in a number of ways. For starters, it gives people unfamiliar with the business process a high-level overview. Because the diagram contains only the most basic information, it also works well if you need to quickly fill in a new person or update someone who worked on the process in the past. Who are the suppliers of the given process? What requirements should the inputs fulfill? Who are your true customers? What specification do customers want for the end product? SIPOC diagram has a pretty straightforward structure. Its whole purpose is to present the information at the core of the process in the simplest way possible. To construct one, you can start with a table with 5 columns. 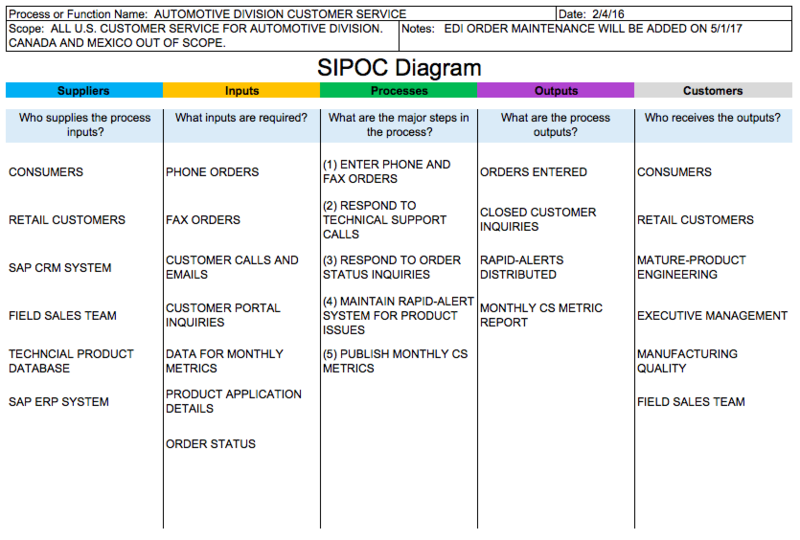 Then, label each column with the letters SIPOC or the words Suppliers, Inputs, Process, Outputs, and Customers. Alternatively, you can download a template on the web. Once you have it let’s move on to filling it out. Make sure you know the exact starting and ending points of the process. If you don’t, this can mess up the whole diagram once you move to the other columns. Don’t go into too much detail. Remember, SIPOC diagram is a high-level process map and is designed to get a birds-eye overview of the process. Do not include decision points or feedback loops. As with the previous step, focus on the key outputs of the process. In this step, write down the three or more main outputs. Use nouns for the most part and keep the tone neutral. 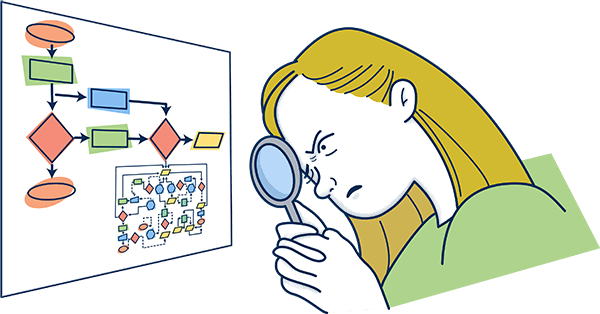 Your goal is to avoid categorizing your outputs into good or bad ones – that’s not the point of the diagram. In this step, list the people who benefit from the process. These don’t have to be the literal “customers.” E.g., if you are working on a diagram for an internal process, the “customers” are your coworkers. Think of who benefits from this process. Who would be upset if the process is not complete? When doing the research for this step, up your game by noting customers’ requirements in the “Output” column. Here you write down the inputs required for the process to function properly. Just like with every previous step, focus on the most important ones. Four to six main inputs should do. In the Suppliers column, write down the suppliers based on what inputs the process uses. Be sure to mention any specific suppliers whose input has a direct influence on the output. For example, imagine you’re doing a SIPOC diagram for the process “Making tomato sauce.” If the supplier has an impact on the variation of “Taste” output, you definitely want to list them. SIPOC diagram is one of the oldest and most-trusted ways to map a business process in the most general way. It gives you a birds-eye overview of the process that could help you with onboarding a new team member or be the foundation of a future business process improvement initiative.